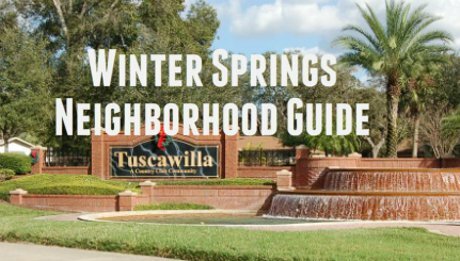 Home to the giant Tuscawilla development, Winter Springs is one of Seminole County's newer municipalities.Winter Springs has the largest land area of any city in Seminole County and the present onset of commercial and residential development is expected to continue. Winter Springs also offers easy access to downtown Orlando because of its proximity to the Greeneway. The Greeneway (417) also offers easy access to UCF and Orlando International Airport. To see Winter Spring's best neighborhoods, click on the Neighborhood Guide below. 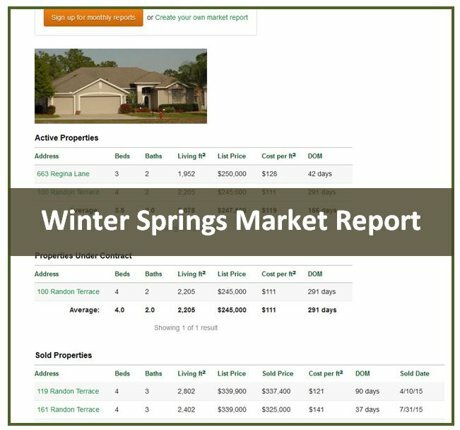 To view all Winter Springs homes for sale, click here or on the blue button above. Winter Springs Town Center is a "suburban lifestyle center" located at the intersection of State Road 434 and Tuscawilla Road in Winter Springs. The center currently has 148,000 s.f. of retail and office space anchored by a Publix grocery store and is part of a master planned mixed-use community known as the City Town Center. Ambitious plans for the center at total buildout include 800,000 square feet of retail, 600,000 square feet of office space, 4000 residential units, and 700 hotel units. Bad timing hit the center shortly after the initial phases were built when the real estate market crashed. The center struggled with vacancies through the first few years, but appears to be recovering well. The vision of the Town Center is to create a vibrant downtown with numerous amenities including shops, restaurants, green spaces, and parks. The Cross Seminole Trail passes right through the town center, making it a destination stop for local residents as well as bikers just passing through. 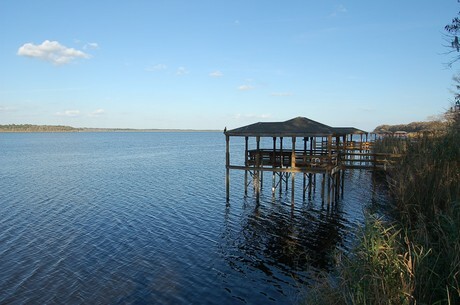 Central Winds Park, the crown jewel of Winter Springs' city parks, is located on State Road 434 overlooking Lake Jesup near Winter Springs High School. The 100 acre park is well-known nationally for its beautifully maintained competition fields for baseball, football, soccer, softball, and lacrosse. These fields, plus 27 acres of practice fields, play host to thousands of athletes and spectators every year. In addition to the sports fields, there is a playground, an amphitheatre, picnic areas, a nature trail, beach volleyball court, basketball court, and an off-leash dog park. Central Winds Park hosts a July 4th fireworks display that is attended by folks from all around Central Florida and is also host to the Scottish Highland Games, the largest outdoor event in Seminole County. 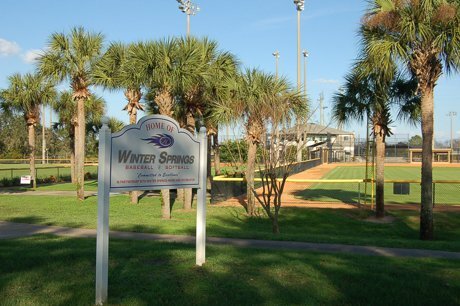 The park hosts Winter Springs Babe Ruth youth baseball and softball leagues as well. Lake Jesup is a large lake between Sanford and Winter Springs that is part of the Middle St. Johns River Basin. While connected to the river, the St. Johns does not flow through the lake naturally. The lake and its flood plain cover 16,000 acres, with just under 10,000 acres of that being surface area. Lake Jesup is shallow, averaging only about six feet in depth, and the bottom is covered with a thick layer of muck. Water quality in the lake declined over the last few decades, due to wastewater and stormwater discharge, agricultural nutrient runoff, and urban development in its watershed. In the last few years, the water quality has improved somewhat, with environmental agencies dedicating millions of dollars to the lake's restoration. Lake Jesup boasts a couple of distinctions. It is the home of one of the largest free standing bridges in the country, which is part of the Central Florida Greeneway (State Road 417), and it is home to the largest single concentration of alligators in Florida and the U.S. It's estimated the lake is home to over 10,000 gators. Trust us, Lake Jesup is not a lake where you want to swim or wakeboard.